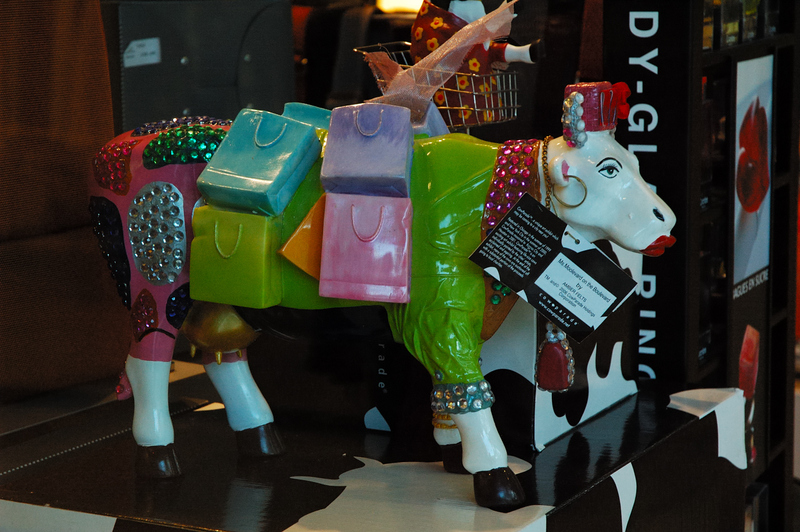 I swear I don't get any commission for showing this cow, it is just that I like the beautiful design and colors on this Ms. Moolevard on the Boulevard by Amber Felts, part of the CowParade scale model collection being sold at one of the stores in Illa Diagonal Shopping Center, Barcelona. I should say that CowParade organizes exhibitions in different countries which some of you have probably seen. Remember those lifesize cows painted in flashy colors scattered somewhere in your city? According to what they state at the website, CowParade "fosters art education through its Cows in Schools(TM) program and benefits charitable causes through its one-of-a-kind cow auctions". What's more if you are a real artist, not my case, you can apply for designing new cows. Recommended: Do you want to see real landscape photography or striking images of wild animals?...take a good look at this artist's work: Wild Things Photography by John Hyde. Beautiful cow, colours and photo! Remember seeing a cow parade some years ago in Cape Town. She is lovely with all of her color. I am going to read more about cow parades as this is new to me. I have so enjoyed seeing Cow Parade in various cities thru DP blogs. Thanks. un dato curioso, sí que causa sensación esta vaca!!! Según veo, también dan la opción para que cada persona pinte su vaca según sus gustos. Thanks for sharing this new one. Thanks everyone for coming. I see you around tonite.-)I am glad some of you heard about cowparade thru my post. I personally had seen these cows just once before and found them very interesting. Very funny, made me laugh!